Contemporary engagement rings feature unique design elements for an exquisitely contemporary look. With their clean lines and graceful curves, contemporary engagement rings appeal to many brides-to-be. Whether adorned with dazzling diamond accents or completely streamlined, our collection of contemporary engagement rings is both fresh and enduring. contemporary engagement rings are wide ranging in style. 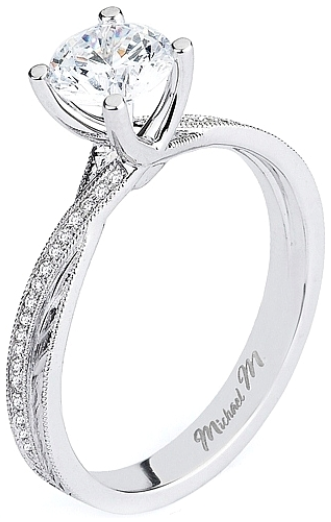 They may feature bezel or semi-bezel set center gems, or even a contemporary halo design. Other contemporary design elements include wider precious metal bands, matte finishes, smooth curvatures, or channel set diamond accents. My love for antique jewelry is well established, but I want to be sure I don’t ignore the plethora of beautiful things available from contemporary designers. 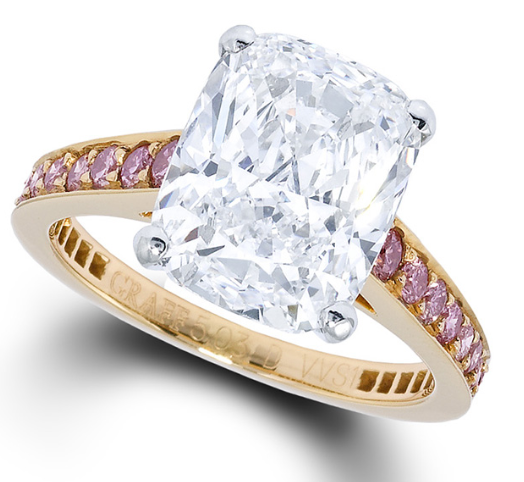 This regal princess of a ring is by Michael M. A very high profile – I’d be worried it would always be getting snagged on things in my purse – but it’s so pretty it’s probably worth it. I know that halos are very big right now, but I think this kind of design can encompass the same ornate feel in a more unique way. Not that I don’t like halos, but there’s something to be said for variety. 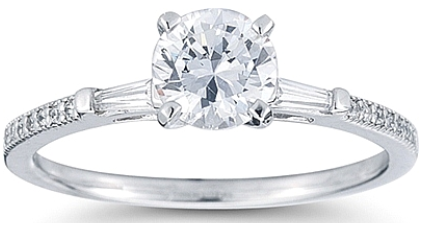 This versatile setting can hold almost any cut of diamond. De Beers Adonis Rose Pink Gold ring with bezel-set marquise diamonds, pav? round brilliants and a claw-set centre solitaire. This one’s a little different and it wouldn’t be right for everyone – but I suspect that the people this is right for would utterly flip out over it. This ring is a bit different from the others – even the website description calls it “petite.” A dainty, well-balanced and extremely lovely setting. 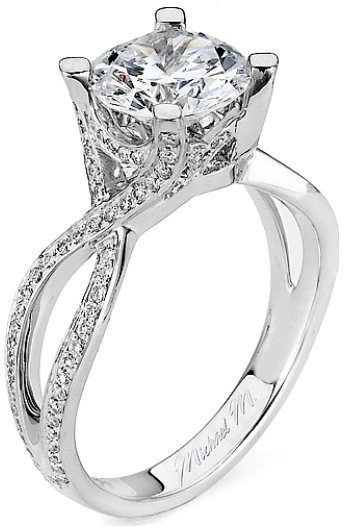 I believe this one would look as beautiful with a smaller diamond as with a larger one. The center stone is flanked by two tapered diamond baguettes, which lead to round brilliant cut diamonds and millegraining along the shank. Subtle and enchanting. 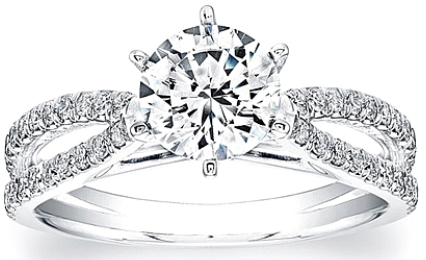 This entry was posted in Engagement rings and tagged 2013, Contemporary, diamond, engagement, rings on September 24, 2013 by erika. Round and princess cut diamonds have long been the most popular styles chosen for engagement rings, but these days, many people want an engagement ring that stands out from the crowd. Pear diamond engagement rings have grown in popularity because they are a classic style that stands out, expressing a greater amount of individuality. Worn with the pointed end towards the fingernail, a pear cut diamond has a slimming effect on the fingers and can really highlight a great manicure. Pear cut diamonds emerged during the Renaissance and are believed to be the creation of the Flemish jeweler, Lodewyk van Berquem, who is credited with a number of diamond advances. Pear diamond engagement rings were particularly popular during the 1920s to 1960s, but faded into the background in the latter part of the twentieth century. 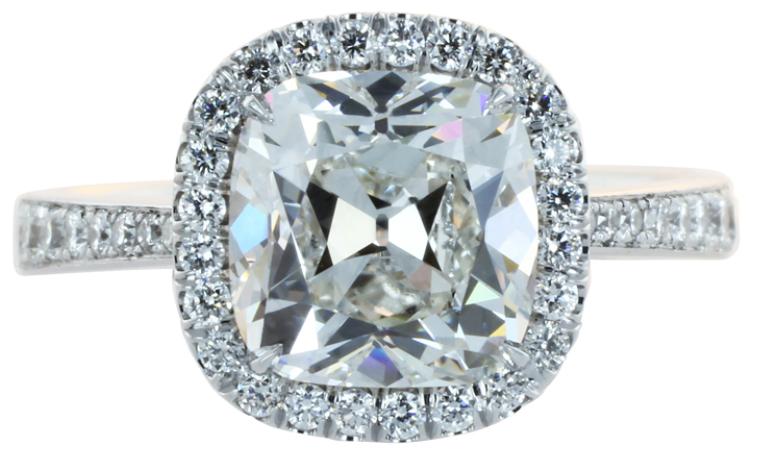 Today, however, the sophistication and glamour that is immediately projected by this beautiful diamond cut is making a comeback. Pear diamonds have a beautiful teardrop shape that is considered a hybrid of the round brilliant and marquise diamond cuts. They are rounded at one end and feature a point at the other. Though there are variations, a pear cut diamond most often features 58 different facets that reflect light and bring out the diamond’s inner fire, offering just as much sparkle as the ever-popular round brilliant cut. Symmetry is a key element determining a pear shaped diamond’s quality. A pear shaped diamond most often has a length to width ratio of 1.40-1.70. Cuts that fall in the wider end of this range are generally considered to be the best choice for pear diamond engagement rings, while the narrower are preferred for teardrop diamond earrings. When you are ring shopping on a budget, it’s worth noting that pear cut diamonds often carry a cheaper per-carat price tag than similar diamonds in a round brilliant cut. This cut is also excellent for making small diamonds appear larger. If you’re looking for pear engagement rings, Dara’s Diamonds offers a wide range of pear diamond solitaires appropriate for any budget. Budget brides will absolutely love this .10 carat pear cut diamond solitaire, featuring a simple cut pear diamond that brings stunning yet subtle sparkle to your finger. If you’re looking for a bit more luxury, consider this absolutely brilliant 1.00 carat pear diamond solitaire made from one of our most premium pear cut diamonds. No matter what size diamond you select, the prong setting will hold it in place with a carefully placed prong at the diamond point to protect this cut’s most vulnerable spot. Each ring also comes with your choice of a 14k white or yellow gold, 18k white or yellow gold, or platinum band. Pear diamond engagement rings provide a unique touch of old-school class and glamour beloved by today’s modern brides. If you’re looking for a pear diamond engagement ring, look no further than Dara’s Diamonds. With more than 150 different pear cut solitaires to choose from, you’re sure to find the right fit for your style and budget. This entry was posted in Diamond rings, Engagement rings, Vintage engagement rings, Wedding engagement rings and tagged 2013, diamond, engagement, pear, rings on September 16, 2013 by admin.